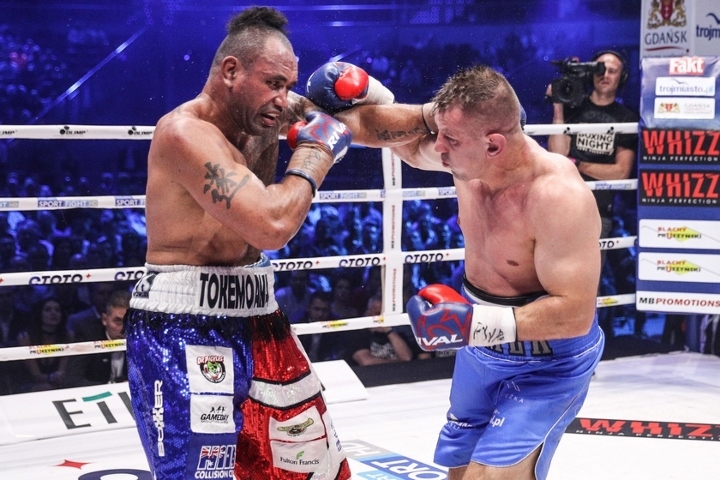 Ergo Arena in Gdansk, Poland - In the main event, former two division champion Tomasz Adamek (51-5, 30 KO) returned after a layoff of just over a year to win a ten round unanimous decision over Solomon Haumono (24-4-2, 21 KO). Adamek, even at this advanced stage of his career, was too good for Haumono. The scores were 100-90, 99-91 and 99-91. 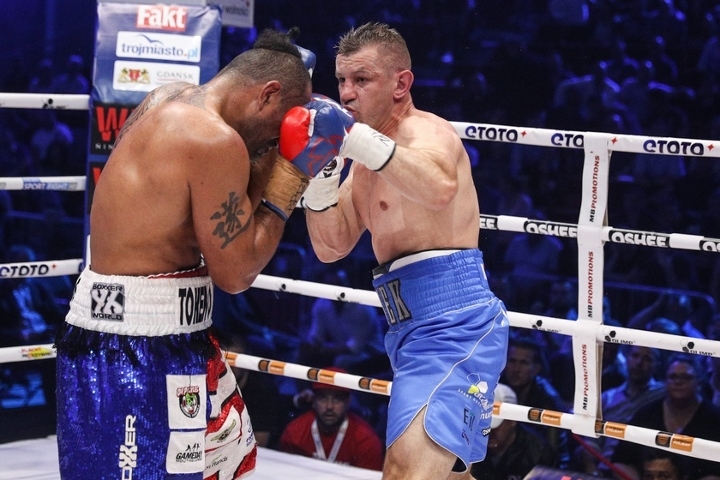 Adamek had been out of the ring since getting knocked out in ten rounds by Eric Molina last April in Krakow. Adamek actually retired following that loss and appeared to be done with his career, but by the end of 2016 he began discussing the idea of coming back. Haumono had been out of the ring since last July, when he was knocked out in four rounds by current WBO heavyweight champion Joseph Parker. 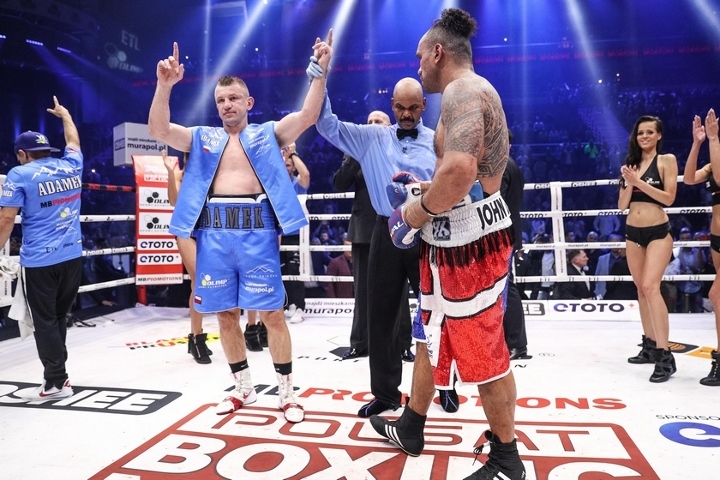 In the co-feature, former WBO cruiserweight champion Krzysztof Glowacki (27-1, 17 KO) was back in full force by stopping previously undefeated Hizni Altunkaya (29-1, 17 KOs) in six rounds. Glowacki was originally scheduled to face Brian Howard (12-1, 9 KO). For Glowacki, it will be his first fight since losing a twelve round decision, and his WBO title, to Oleksandr Usyk last September. He wants to work his way back to another world title opportunity very soon. 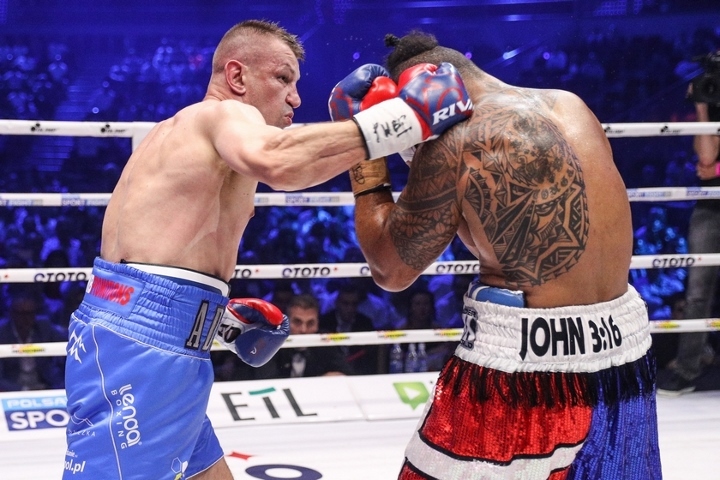 In a crossroads fight, a battle of cruiserweights saw Mateusz Masternak (39-4, 26 KO) continue his comeback with a ten round unanimous decision over veteran Ismail Sillakh (25-4, 19 KO). The scores were 96-92, 95-93, 95-93. Both fighters were looking for a big win to continue a potential run to a title shot. And both boxers were highly touted amateurs and being pushed heavily in the pro ranks before each suffered his first career defeat. Also on the card, undefeated prospect Maciej Sulecki (25-0, 10 KO) continued his progression by scoring three knockdowns and taking out Damian Bonelli (24-2, 22 KOs) in three rounds of action. After a two week stay in Poland I have many good memories left. I surely won’t forget my visits to Tomaszowie, Mazowieckie, Spale, Pisaczno, Warszawa, Torun and Biala Podlaska. Boxing fans can always count on my pictures with autographs. I have received many requests from my fans and I appreciate the support. I would like to thank everyone that I saw in Poland once again, I will never forget the warmth and sympathy I received from everyone. I would also like to thank the president of the International Police Association, Arkadiusz Skrzypczakow for giving me an honorary IPA member title. I would also like to dedicate a separate thanks to the organizer of all my meetings- my sponsor, Las Vegas Energy Drink. Now everything is behind me. On last Thursday (June 27,2013) my promoters organized the first press conference before the August 3rd fight with Tony Grano. The conference took place in the well known Polish club, Wisla in Garfield. My opponent Tony Grano did not interrupt his training and therefore did not show up to the conference. I think that the meeting with the reporters was very fruitful, even after my long break. Return to the ring after a long vacation. The contract has been signed- Tony Grano will be my opponent at the boxing gala August 3rd, 2013 at the Mohegan Sun Casino in Uncasville, CT. I know that I don’t know anything. I promised a longer break from boxing and I kept my word. I did not say though that I will not be continuing my blog. Fans are waiting for news from and I have been silent. It’s time for a few words of explanation. After the fight with Cunningham I was going to have a longer break in order to get away from the fast world of boxing. The break was to heal my body after getting beat up for so long. I accomplished that goal and I have been training again with Roger Bloodworth for a month now. Tomorrow we are beginning strength training. The media has been introducing many of my new opponents. Alsmore fight dates have been discussed. Last Thursday, Ziggy and I showed up in Wroclaw and many people couldn't believe their eyes. As we were walking down the street we heard people saying that we went to Poland to see the fight between Golota and Saleta. No,The goal of our fight is different. I can write about it now because we already had our meetings and talks. We flew to Poland for a quick and short visit and we were invited by a few sponsors from Poland who are interested in my fight in Poland. Alas winter has reached the East coast of U.S.A. After hurricanes and floods mother nature is showing another strong side in New Jersey. We are not giving up and we are fighting with the heavy snowfall. The most digging we had to do was to get to our parking spot behind our house. Instead of going to the gym I'm burning calories by digging up all the snow around my house. In this cold I could use a nice warm coat from Poland. January went by quickly but not without hearing about it in the media. I went to Lake Placid as always, to ski and to rest from boxing. The slopes are 7.5 km long and I got to go down the slope 20 times in one day. That many kilometers on my legs serves as an excellent strengthening workout. But this doesn't count after the fight. What was important was seeing, reading and hearing what the media had to say. It was an absolute media chaos. Drunk Adamek totals his car and is going to jail for a year. From a small sliding accident in a cold and icy city they blew up to some huge collision.